Response effectiveness is increased by detailed contingency to “pre-contract” and otherwise attempt to develop some level planning and joint training. Best practice calls for joint train- of understanding before a casualty. ing and exercises involving response agencies and commercial Anyone who has been involved in marine casualty response salvors. Salvors need freedom of action if they are to use their knows that the potential for disagreement, delay and confron- best endeavors. They need to be con? dent that their plan, per- tation is all too apparent. Circumstances are usually challeng- sonnel and equipment will be supported by the authorities and ing, the environment is dif? cult, time is tight, the authorities the ship’s interests. Most importantly, operational decisions are demanding and the sums of money at stake are enormous. The international Salvage Union is the global trade association may not intervene while a salvage operation is still in prog- for the marine salvors. Today, it has some 60 members. 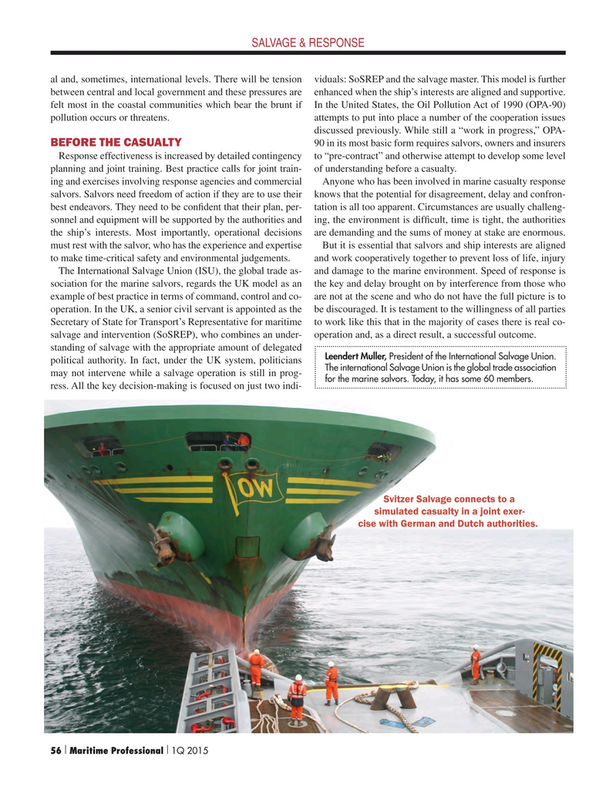 Svitzer Salvage connects to a simulated casualty in a joint exer- cise with German and Dutch authorities.